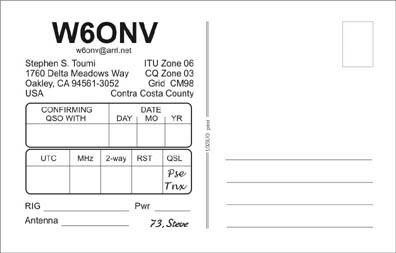 Licensed in 1995 as KC5NWR in Arlington, TX I did not really get into amateur radio until I renewed my license in 2005 taking a “vanity call sign” as W6ONV. The reason for the call letter change was twofold. 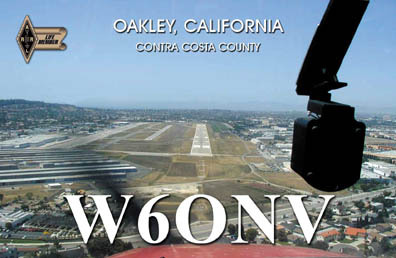 First I had moved back to California and wanted a call sign reflecting my geographical location and second, it was my father’s previous call sign before he became N6SV years ago. When I moved to Oakley (CM98da), California in 2003 I joined the Mount Diablo Amateur Radio Club and started monitoring the local MDARC repeater (147.060) with a Kenwood TR-7600 2m transceiver. On February 17, 2007 I successfully passed Element 3 for my General License and bought my first HF rig, an ICOM IC-718 and a Hustler 6-BTV vertical antenna. In April, 2007 I erected the 6-BTV on my garden shed with band specific radials. After 3 months I finally received a notice to take down my “tower” as it was not allowed under the HOA’s CC&Rs. A month later I erected the 6-BTV a second time, under the disguise of a flagpole. This time it was ground mounted with about 16 radials. After a winter storm snapped one of the aluminum tubes, I was off the year until early 2008. After replacing the broken tubing, I decided to make a presentation to the board of directors at a home owners association meeting. I petitioned the restriction in the CC&R, providing them information about amateur radio, what I wanted to erect, as well as photos and a petition from my surrounding neighbors. I still consider myself lucky, but I won my case with the HOA. At the end of 2008 I joined the Northern California Contest Club and started participating in sponsored contests (aka radiosport). I am still learning the ins and outs of contesting and spend as much time as possible over at N6RO in Oakley, which is the local “big gun” station. The guys who man the radios at ‘RO’ are very experienced and I have a great deal to learn from them.